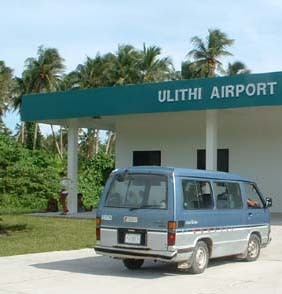 (Ulithi Atoll - OC-078) from Fri 29 Aug to Sun 31 Aug 2003. The operation was CW and only on the WARC bands. 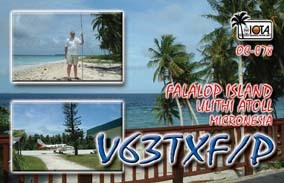 V63TXF/p : QSL via G3TXF . EU 62.5%, Asia 30.4%, NAm 4.0%, SAm 0.8%, Africa 0.4% and Oceania 1.8%. The QTH on Falalop was facing towards the South-West, which was a bad direction for Europe and an awful direction for North America. The 3,300 ft runway on Falalop Island which traverses from one side of the island to the other was first built as part of the occupation of the Ulithi Atoll by US forces during WWII. 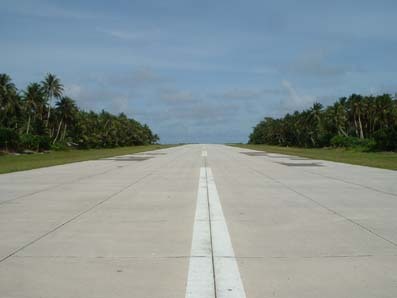 Today the long runway on Falalop is only used by the small Beechcraft operated by Pacific Missionary Aviation (PMA). 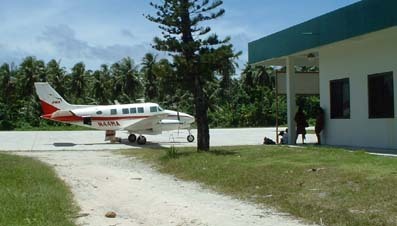 PMA have two Beechcraft (N44MA and N46MA) at their Yap centre of operations. N44MA is seen here on the left waiting to depart, taking V63TXF/p back to Yap after three days on Falalop. 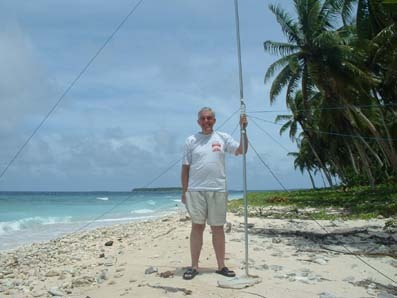 Nigel G3TXF on the beach at Falalop with the WARC band trapped dipole used for V63TXF/p. Unfortunately the beach was 'on the wrong side of the island' in that it was on the South-West side, whereas North would have been the ideal direction. Despite this, 3,100 CW QSOs were made on the three WARC bands in two and a half days, with over 62% of QSOs being in Europe. Although far from ideal for short-path to Europe, the location did provide one excellent long-path opening (at around 07z) to Europe on 30m. The above photographs relate to two earlier operations from Falalop Island. According to the RSGB IOTA Directory there have been three previous operations from Falalop : KC6CG, KG6SW/KC6 and V63CS/p. 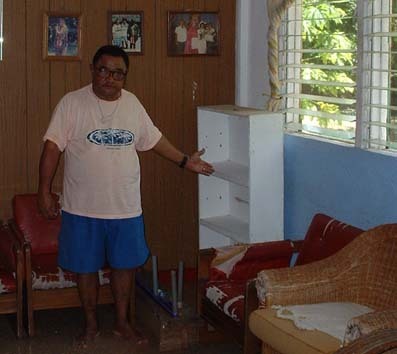 Local Falalop resident John Rulmal (pictured above) remembered two of the earliest operations. Although John is not a ham, he has been interested in Amateur Radio for many years. 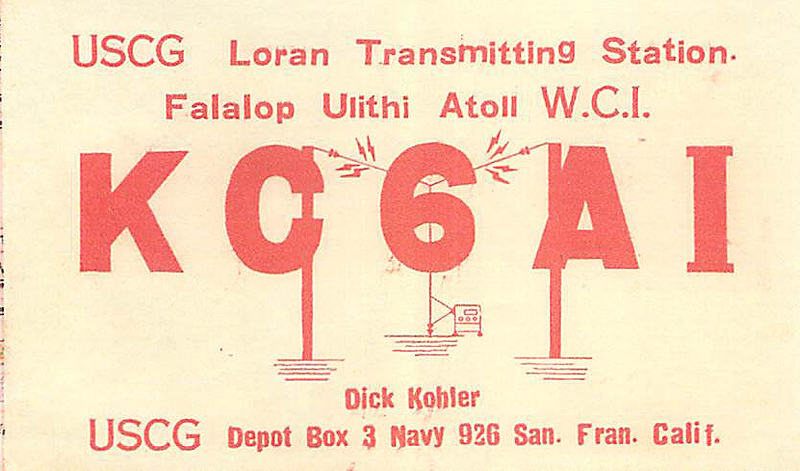 He recalls that the US Coast Guard club station KC6CG used to operate from the transmitter building shown in the left hand picture. 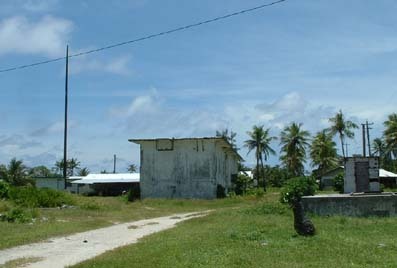 A large LORAN transmitter station also used to operate from that location, and the picture shows the one remaining wooden transmitter mast. The remains of an open-wire antenna feed system is visible on the old transmitter building itself. KC6CG is believed to have closed down in the late 50's. John also recalls KG6SW visiting Falalop and operating as KG6SW/KC6. The right hand picture above shows John indicating the spot where KG6SW/KC6 operated from his house sometime in the 80's. 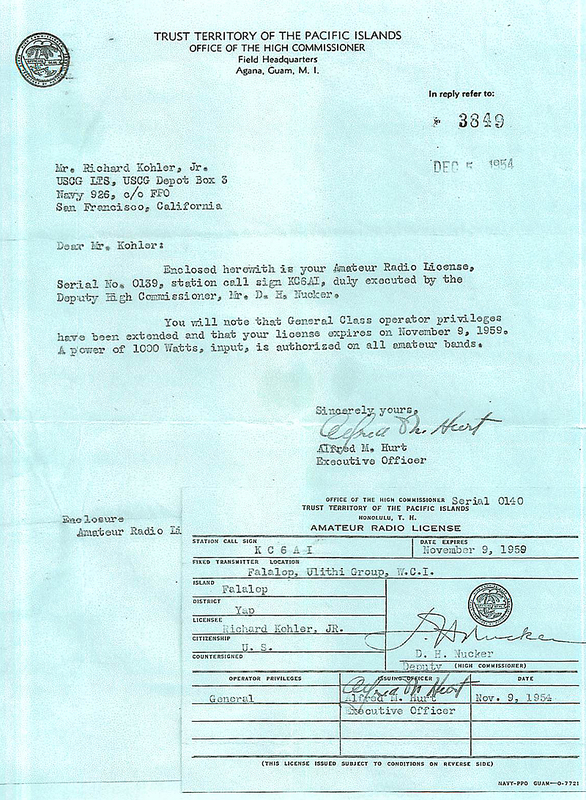 Following mention of KC6CG on this web-page, in November 2009 a letter was received from Richard Kohler who was the original licence holder of KC6AI in 1954. This letter gives interesting back-ground on KC6AI and KC6CG. 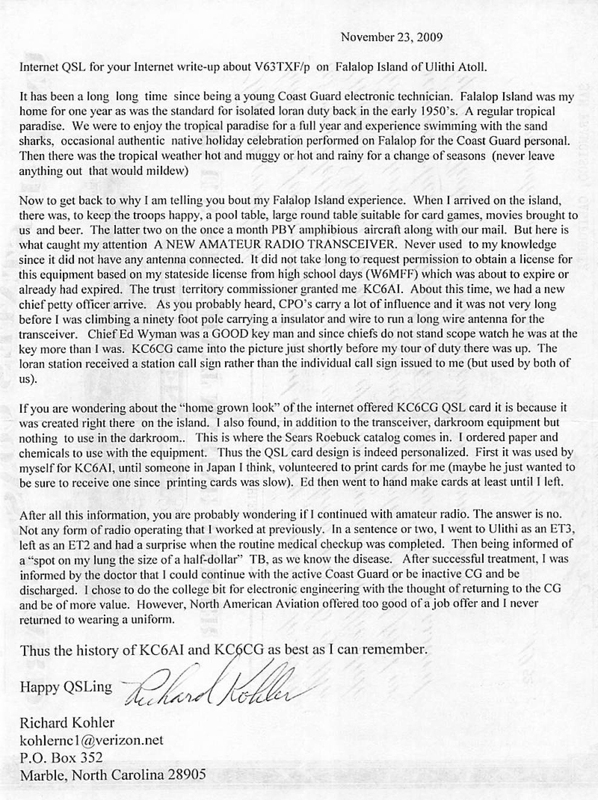 Richard also sent along a copy of his original KC6AI licence as well as a KC6AI QSL. Many thanks to Richard for providing this interesting historical background to KC6AI and KC6CG.